Tomato curry is a dish that my mother makes a lot with traditional Sri Lankan “hoppers” (rice flour and coconut milk pancakes). It can also be made into more of a main dish for vegetarians with the addition of tofu, and can be served over rice, couscous or quinoa. Tofu on its own is very bland, but takes on the flavors of the curry very nicely. 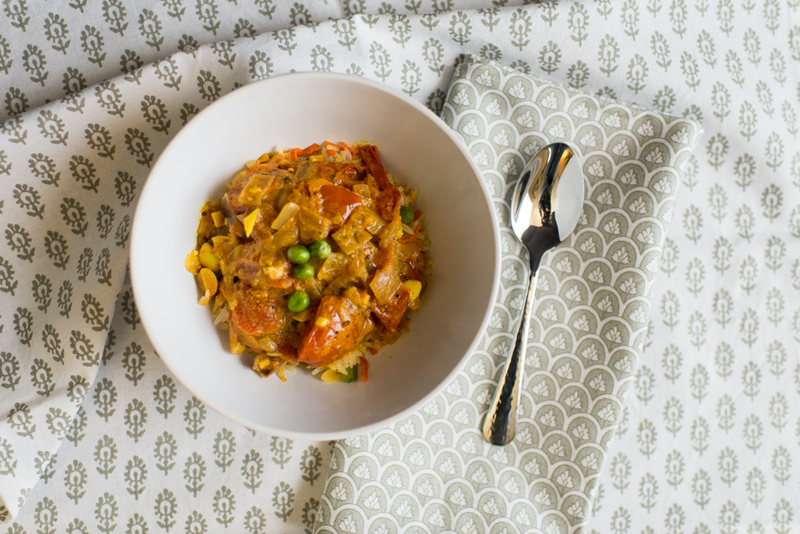 This curry is a great mild introduction to curry flavors for little ones. Many of the spices, like turmeric have wonderful health benefits, too. Exposing kids to ethnic foods is a great way to widen their palates and expose them to ingredients with positive effects on health. See our post on Food Passports to encourage kids to eat ethnic foods. We recently served this to a group of Elementary Students at an International Food Tasting. Heat oil in a medium pan. Add onions, garlic and ginger. Stir fry for 3 minutes. Add spices, and stir fry for another minute. Add the tomato. Cook on medium/low for 5 minutes until the tomatoes are soft. Add the tofu and sugar. Cook for another 4 or 5 minutes. Add the coconut milk and bring curry up to a simmer. Add salt and pepper. Serve warm.